My friend Jim emailed me this morning informing me of the sad news that veteran film composer, John Barry had died at age 77. We're at a time now where many of my favourite personalities are leaving us - I was also very sad to hear of the passing of director, Blake Edwards a couple weeks ago. Both John Barry and Blake Edwards were highly representative of my favourite era of movies: the 1960's. Yes, I know many movie buffs won't share my opinion of the films of that era, but I personally love the STYLE of everything from the 60's - in movies, music and television. And both of these talented men helped to shape that style. 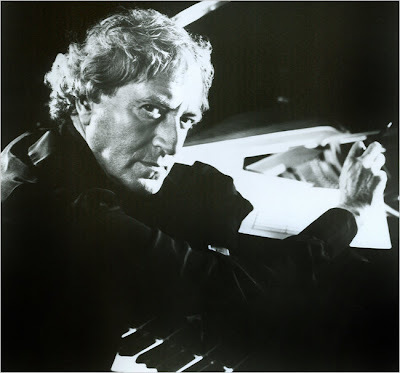 In the case of John Barry, he was one of a handful of film composers that I really admired from that era, the others being Henry Mancini, Michel Legrand, Maurice Jarre, and Ennio Morricone. All of these incredible composers wrote memorable and melodic film scores, often with title tunes that went on to become well loved standards. Barry was of course best known for creating the exciting scores from the James Bond films of the 60's through 80's. He won Academy Awards for both the title song and score to Born Free, about the orphaned lion cub, Elsa. I even have the soundtrack record album for Disney's The Black Hole, a somewhat disappointing film somehow made more interesting through John Barry's imposing and exciting score. Anyway, I figure the best way to celebrate this legendary film composer is to listen to his music. Here then is the maestro himself conducting his score from Goldfinger, followed by another YouTube clip featuring the wonderful Shirley Bassey reprising her rendition of the title song in concert. Enjoy! What a loss. James Bond will never be the same without him. Charlie Callas died on the 27th also, with barely a mention anywhere. Some of us remember him though! Bond co-producer Harry Saltzman couldn't stand Goldfinger and I believe he also hated Diamonds Are Forever. In general, if you had to pick the most important "behind the scenes" people in Bond films BY FAR the biggest contributions were made by Ken Adam and John Barry. Barry was just a genius composer, period. He was a genius because he understood the two greatest genres of music, classical and jazz. If I had to pick the best Barry Bond score, and in general the best Bond score ever, it would be On Her Majesty's Secret Service. What is funny though is that Adam and Barry made it so big outside of Bond and so few did. The only actor who became a powerhouse on his own in the industry was Sean Connery. Sorry for the trip post but Michel Legrand and Bond...wow. That score for Never Say Never Again was just garbage. Even Eric Serra and David Arnold and look down on this guy. Ironically, Ricardo, "Goldfinger" and "Diamonds Are Forever" happen to be my two favourite Bond films, although I will concede that the latter title may not stand up well to critical scrutiny. I confess I like it mostly for redheaded Jill St. John as Tiffany Case, so it's sort of a guilty pleasure I suppose. Pete: Sorry. I meant Harry hated the songs. He couldn't stand them ! Needless to say, Saltzman and Barry never got along. As for the films, yeah I do enjoy them. DAF is not much of a thriller but it's hilarous. You'll never find a Bond film with funnier dialogue. And you are so right about Binder ! He created the gunbarrel as well as those beautiful titles. I'd have to say You Only Live Twice is my favorite. I love Barry's scores for the James Bond films - they're so memorable and wonderful! John Barry is a PURE genius.